With a foundation in multi-axis cutting machinery, Bell Laser has experience in all important technologies when it comes to laser cutting machinery. Our fundamental knowledge of linear motion, controlling hardware and software, designing software to nesting and optimization algorithms, to training and technical support gives you the Bell Laser edge. Combined with an experienced team, with each member having over fifteen years in this field. When it comes to industrial laser manufacturing, industrial laser optics and custom machinery handling manufacture, we've got all your bases covered. If you want an off-the-shelf laser machine for your needs, we've got them. We are able to convert your unique challenging needs into automated laser-based machinery solutions. We listen to your needs and wants, then after compiling them together we seek out work already done in this field. Next, we provide you with optional designs and proof-of-principle tests to demonstrate the viability of design paths. 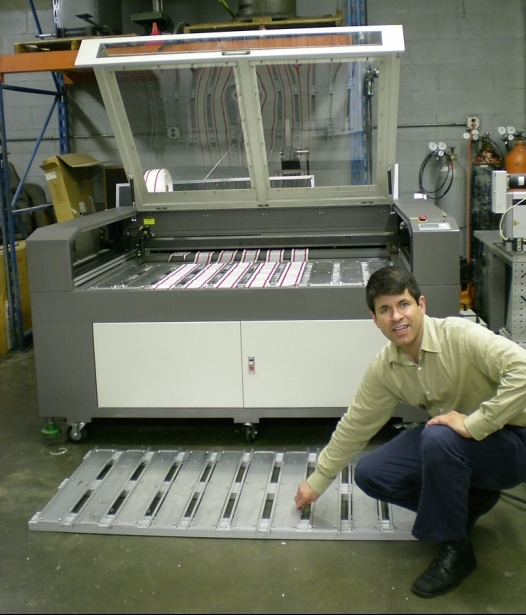 In the end, you get a quote for a custom machine that meets your needs. After acceptance, we fabricate, deliver, train and provide support. Our customers include small shops to multi-billion dollar manufacturing organizations. The laser industry provides a fast-paced environment because the technology is revolutionary in its applications. The non-contact cutting, marking, engraving, annealing, welding, etc., are rapidly making place in the burgeoning industrial marketplace. Bell Laser is busy and growing to meet your needs better, whether it is with an off-the-shelf machine or custom machinery configured for you. Our network of sales representatives can visit you at your facility. Bell Laser has sales representatives throughout the United States and rest of the world.